Ask fellow campers about "Island Lake Campground" and nearby attractions. This campground has become a mecca for 4-wheelers. Campground road has many holes and is very dusty. Owner does not live on premises. Camp Host unreliable and campground rules not enforced unilaterally. We camped at Island Lake Campground in a Motorhome. Island Lake Inn has a nice walleye sandwich. Boulder Lake Environmental Learning Center an easy drive. 30 minutes to most Duluth attractions. We've been seasonal campers here for the past 3 seasons, and will be here again this season. The campground is really coming around. The sites are huge, other seasonal campers are friendly. Since my last review (2013)... - There is water hooked up at the dump station now. Pump service wasn't the best at the beginning of this last season, but owner took control and really did a great job towards the end. - At the end of last season, they cleared a big area that will be used for a playground and bathroom/shower facility. Hopefully that gets done early this season. We saw a lot more kids at the campground this last season, so it would be nice for them to have something else to do. - The trail from the campground to the beach is nice for using golf carts or UTV's. We've biked it, too. Pretty long trek for hiking. We measured it last year and I believe it was just over 3/4 miles from our camper door to the sand on the beach. The beach is very nice and there is a spot next to it to pull your boat up on shore. - From campground entrance, 5 boat launches within 5 miles... 1 mile to United Northern Sportsmen launch on Island Lake (Membership required). Less than 2 miles to MN Power public launch on Island Lake. 2 miles to Abbott Rd public launch on Island Lake. Less than 2 miles to Silver Fox on Boulder Lake. Less than 4 miles to Boulder Lake public launch. - Island Lake Inn, Silver Fox, and Boondocks within a couple miles for food & drinks. Also, ice cream shop and Porky's for groceries, gas, bait, and liquor. We camped at Island Lake Campground in a Travel Trailer. Love this campground! The owners are wonderful. We came to camp for 3 nights, now we are seasonal here. The campsites are huge, lots of privacy, clean, quiet. It's new so no showers or toilets except out houses (they are the cleanest I have ever used) they are working on getting some. No golf carts driving around; you can take a walk without bring afraid of getting run over. The lake is a little walk, but worth the hike through the woods, beautiful trail. The lake is clean, big swimming beach. So glad we came here. 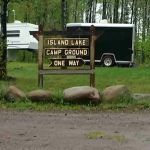 We camped at Island Lake Campground in a Motorhome. Swimming, walks, hiking, lots of fun. We stayed in this park overnight only. The sites are huge and very separate from each other. The night we stayed, the mosquitoes were so big and plentiful they could carry you away. Setting up was a real challenge with all the bugs. The first site we chose had no electric active, so after getting all set up, we had to unset up and move. The campground itself is very nice in terms of its natural settings being preserved. I think this might be used for long summer stayers as well as campers who just stay a night or two. Kind of like having your own north cottage. The people are friendly and accommodating. We walked over to the restaurant and had dinner which was fun. There is no path really between the campground and restaurant yet. The road worked. I think a standard price of $40 is a little high actually; the price does go down with longer stays, however. We were given a discount for confusion over directions and the terrible mosquitoes. That was so nice. We might stay again but the bugs were so disruptive. I guess sometimes you have to pick either stay in a parking lot with fewer bugs or woods with more bugs. We never know quite what is best. These people are trying hard, are kind and responsive and the spaces are lovely. We camped at Island Lake Campground in a Travel Trailer. We like this campground because of the big sites and privacy. The campground is new, so they don't have showers/bathrooms yet. They do have a dump site, but no water hooked up there yet. Not sure about the pump service. We spoke with one seasonal guest who said he pumps himself out, as it never seems to get done when he asks. There isn't a playground, but lots of kids biking and playing with the big sites. The lake is across the highway from the campground, which is a little inconvenient, but there's a beautiful public beach there. Location is nice with Island Lake and Boulder Lake right nearby, as well as many other lakes within minutes. A short drive/bike from the campground, you'll find a couple of bars/restaurants, an ice cream shop, and a convenience store with gas and groceries. We camped at Island Lake Campground in a Travel Trailer. 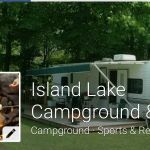 Are you affiliated with Island Lake Campground ?